There is uncertainty about outcomes differences between partial breast irradiation (PBI) and whole breast irradiation (WBI) for early-stage breast cancer. Prospective randomized trials comparing adjuvant PBI to WBI in early-stage invasive breast cancer were identified using PubMed. Odds ratios (OR), 95% confidence intervals and absolute risks were computed for pre-specified efficacy and toxicity outcomes including cosmesis. Subgroup analysis evaluated the effect of PBI modality (external beam radiation treatment [EBRT], intraoperative radiation treatment [IORT] or brachytherapy) on efficacy. Meta-regression analysis explored the influence of median follow-up, patient and tumor characteristics on results. Nine trials comprising 14514 patients were included. 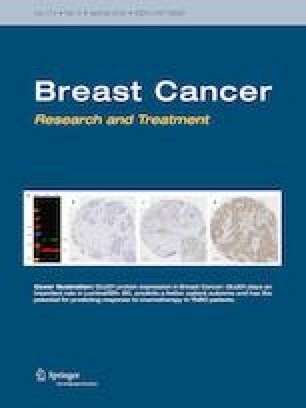 While PBI was associated with increased odds of local recurrence compared to WBI (OR 1.69, P < 0.001), it was associated with reduced odds of death without breast cancer recurrence (OR 0.55, P < 0.001) and with improvement in overall survival (OS) that approached, but did not meet statistical significance (OR 0.84, P = 0.06). Subgroup analysis for PBI modality showed significant differences in the odds of local recurrence, based on method of PBI with EBRT showing the lowest magnitude of inferiority. Nodal involvement was associated with higher local recurrence risk, while larger tumors were associated with lesser improvement in death without breast cancer recurrence and OS. PBI was associated with higher odds of fat necrosis (OR 1.72, P = 0.002). Worse cosmetic outcome with PBI approached statistical significance (OR 1.23, P = 0.06). Compared to WBI, PBI is associated with higher odds for local recurrence and toxicity, but less death without breast cancer recurrence. The balance between benefit and risk of PBI appears optimal for women with smaller hormone receptor positive tumors, without nodal involvement and treated with EBRT. The online version of this article ( https://doi.org/10.1007/s10549-019-05209-9) contains supplementary material, which is available to authorized users. Yasmin Korzets, Anthony Fyles, and Daniel Shepshelovich declare that they have no conflict of interest. Eitan Amir declares that he has received fees from Genentech/Roche for Expert Testimony and from Apobiologix for Advisory Boards. These fees were outside of the submitted work. Hadar Goldvaser declares honorarium payment from Roche for invited speaker. These fees were outside of the submitted work.